View of a cottage on the banks of the River Dee between Crogen and Llandrillo in North Wales. The artist was Thomas Walmsley (1763-1806) and the engraver and publisher was Francis Jukes (1745-1812). 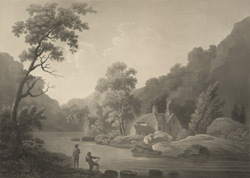 Jukes was a prolific engraver who was principally known for his topographical prints, the bulk of which were aquatints.